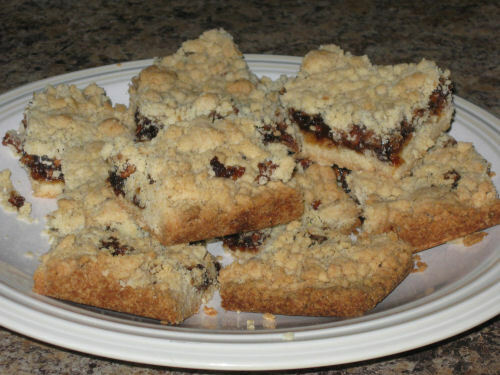 Mincemeat may not be everyone’s favorite ingredient, but you’ve gotta try these bars. 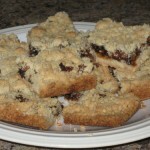 The shortbread base and crumbly topping enables the center filling to be something that folks are surprised about. Everybody in my house eats them. You may need to soften up the mincemeat by placing it in a bowl and microwaving it for a few seconds to make spreading easier. Preheat your oven to 375 degrees. Grease a 9 x 9 pan. Using your standing electric mixer or a hand held mixer, cream the butter for 1 minute. Add sugar and beat for 2 minutes. Beat in the vanilla. In a separate bowl, whisk together the flour, cornmeal and salt. Gently stir the dry ingredients into the butter mixture just until its incorporated. Evenly press 2/3 of this shortbread into the bottom only of the pan. Evenly spread the mincemeat over the shortbread leaving a 1/4-inch border all around. With your fingers, crumble the remaining shortbread dough over the mincemeat. Gently press the dough into the mincemeat. Bake for about 40-45 minutes – until golden brown on top. Remove and place on a wire rack. Let set for 10 minutes, then cut. Cool completely in the pan before removing.